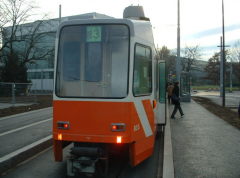 December 11, 2011 witnessed a major re-organization of the Geneva tram system. Some lines have disappeared - Oh where oh where has my Number 13 gone? - while others are supposed to be operating with greater frequency. I have started meticulously timing my waits for the Number 12 since it is the only line left into the city from Carouge. Someone took away my tram 13 in exchange, they said, for better service. I am constantly checking if that is actually happening. And I won't even mention the sprints at Plainpalais to change from Number 12 to 15! There is more physical action there running to change trams than in my gym on the treadmills.